**2 x 160g gatefold LP. 1st edition of 500. Features music by Jean-Claude Vannier, Benajamin Britten, Félicia Atkinson, a.o. ** "A subjective compilation by David Le Simple and Vincent Romagny after the three exhibtions cycle ‘Doppelgänger’ at Ceaac curated by Vincent Romagny. 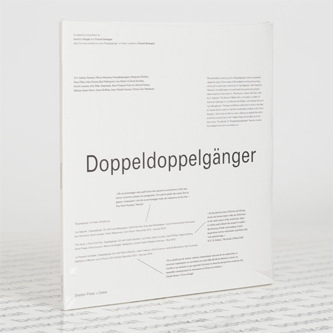 The double LP ‘Doppeldoppelgänger’ is a purely subjective compilation of sound works by artists (Félicia Atkinson, bruant&spangaro), sound from films by artists (David Lamelas), sound poetry and performances (John Giorno, Karl Holmqvist, Lisa Holzer & David Jourdan); of works by very different cult composers (Benjamin Britten, Jean-François Pauvros, Gérard Pesson, Jean-Claude Vannier), legendary groups (Deux Filles) and unclassifiables (Potima Zen Neuman, Joiejoiejoie); and of specially recorded reprises: Aidons Antoine mixing Karl Holmqvist, Melissa Saint-Pierre reprising Colin McPhee, Anne Steffens and Don Niño performing Kurt Weill and David Le Simple mixing « Minh singt seine Sehnsucht ». The LP reflects the same concern that drove the exhibitions making up the Doppelgänger cycle: avoidance of thematic and formal constraints in in pursuance of shifts in the concept of the « double ». Plus an underpinning of literary texts – whence the many quotations to be found on the sleeve. Like Gérard Pesson transcribing Brahms's « Fourth Ballad » from memory years after hearing the work (Nebenstück); and like Robert Rauschenberg reading, along with other artist friends of John Giorno, from the latter's Pornographic Poem on the disc of the same name: the task here is to recompose what haunts us and to repeat what moves us."